Fungus Gnats are insects termed as pests for plants. It is an insect that is most commonly found in and around decaying vegetation, damps, fungi, and algae. Adult fungus gnats are considered quite the nuisance and not only disturb and damage plants in home gardens but can also play havoc in plant nurseries and greenhouses. Fungus gnats are known to belong to the fly family and adult gnats look quite similar to a fly. They are small and dark in color and belong to the families of Sciaridae, Fungivoridae, Diadocidiidae, Keroplatidae, Ditomyiidae, and Mycetophilidae. The common habitat of fungus gnats is wet forests but they are also found in a variety of other places that include swamps and the moist regions of open grassland and heath. This type of gnats is found across the United States and most commonly inhabit dead plant materials or fungi. It is a small gray-black fly that is noticeable around home gardens and windows. Adult fungus gnats are the real trouble makers and they are normally slender in shape and measure around 2.5mm (1/8 inch) in length. They don’t possess the trademark insect antennae and long legs. They cannot fly too well but have the ability to run rapidly across most soil surfaces. The female fungus gnat can lay almost a hundred eggs or even more during its lifetime. Adult female fungus gnats can produce several generations within a year. The female gnats can produce anywhere from 30-200 white or yellow eggs. They normally deposit these eggs in cracks or crevices present on the surface of moist mediums and this can include plant leafs as well. Normally, the preference of egg laying surfaces includes those where the fungus has already grown or is growing. These eggs are oval in shape and are semi-transparent but they will be rarely visible to a naked eye. They can be laid singly or even in groups of 10 or 20 or even more. The eggs hatch into larvae within a period of four to six days. The fungus gnat larvae normally feed on fungus but can consume plant leaf and roots as they provide it with a rich source of nutrients. This can often lead to a diminished health of plants and some plants like the Venus fly trap can even die. One of the symptoms of fungus gnat larvae infestation in plants is visible signs of stunted growth or development. Gnat larvae are also known to carry a variety of plant pathogens, which can make the host plants susceptible to numerous threatening diseases. The larvae mature and become maggots, which are around 5.5mm (1/4 inch) long. The maggot consists of a shiny black head with transparent white body. The maggot will reach its maturity stage within two weeks. At that time it ceases feeding and spins into silken cocoon while shedding its skin. In about a week’s time, the maggot transforms into a pupae. The adult fly emerges soon after the pupal period, which is normally 3-7 days and this cycle starts all over again. The adult fungus gnat lives for 8 days. Adult fungus gnats never threaten human health nor do they damage plants; it is the larvae that are considered dangerous to plants. Adult gnats are only considered as a nuisance. Fungus gnat larvae if present in large numbers can cause severe damage to plant leaves and roots. They are known to stunt the growth of plants especially seedlings and younger plants. Research studies have revealed that the larvae can cause a significant amount of root damage, which can lead to the death of the plant. This type of severe damage has been observed in mostly houseplants and those that are grown within the home interiors. Hence, if you have a houseplant that seems to be wilting away may not necessarily be due to lack of water or sun but because of root damage caused by fungus gnat larvae. Fungus gnat larvae or maggots can cause serious root damage to several types of plants including Venus fly trap, African violets, cyclamen, carnations, foliage plants, poinsettias, and geraniums. Fungus gnat larvae are also one of the causes of different types of fungal root rots in plants. This includes called Fusarium and Pythium fungal diseases. It also harbors Botrytis pathogenic fungus, which causes a disease known as Botrytis blight or gray mold. The best way to control fungus gnat larvae infestation and protect your plants is by following an integrated pest management strategy. This type of management strategy can consist of biological treatment, chemical measures, and use of organic methods. Let’s take a look at the top methods for dealing with these pests! There is a variety of chemical measures that can be put in place for effective fungus gnat control. They are highly effective in controlling adult fungus gnats. Killing of adult gnats will ensure there are no more reproductions and this will enable a healthy future of your plants. Pyrethrins are considered to be botanical pesticides that are derived from the flowers of specific varieties of chrysanthemums. Pyrethrin is a type of contact poison, which penetrates the nervous system of the gnats and repeated sprays every alternate day can help in reducing their population considerably. Some of the other chemicals that can be used for controlling them include cyfluthrin and bifenthrin. This is one chemical that is really effective in killing the fungus gnat larvae. The best way to kill the larvae is by spraying a mixture of Hydrogen Peroxide (1 part) and water (4 parts). In order to be extremely effective, you need to spray this mixture once every week for a few weeks. This gnat spray mixture is not harmful to the plants. Different types of beneficial nematodes can be used for effectively controlling fungus gnat infestation and this includes Steinernema carpocapsae, Heterorhabditis bacteriophora, and Steinernema feltiae. Among the beneficial nematodes, Steinernema carpocapsae (Sc) is the most effective for controlling fungus gnats or mushroom fly larvae. This type of nematode has a surprising feature also known as the "shallowly-waiting-hunting" or “ambushing” feature. This characteristic makes them much superior as compared to other species for gnat control purposes. Talk about natural enemies of fungus gnats and the rove beetle tops the list! Atheta is a species of rove beetle that is a predator by nature and feeds on small mites and insects including fungus gnats, springtails, aphids, and shore flies. They prefer coarse and loose soil and can be employed in similar soil conditions. This is a small light brownish mite that is a natural predator of the fungus gnats. It is less than 1mm in size and preys on different types of soil organisms. It is highly effective for controlling fungus gnat larvae. They can be purchased from specialist suppliers or garden centers and the recommended usage are 30 Hypoaspis Miles per square feet of soil area. This is most commonly known as Bti and it represents a group of bacteria. Bti is a highly effective biological control agent and can kill fungus gnat larvae. They are not toxic to humans or animals nor are they environmental contaminants and hence can be applied to the soil or plant that has fungus gnat larvae infestation. The larvae eat the Bti and get infected leading to death. Synacra sp., is a naturally occurring parasitoid wasp that is highly effective in killing fungus gnat larvae. The female Synacra normally lays its eggs in the fungus gnat larvae. As a result the Synacra wasp larvae when formed feeds inside the gnat larvae till it pupate. There is a wide variety of sticky aphid or fungus gnat trap available at gardening supply stores. These sticky traps are a non-toxic way of controlling or reducing the adult fungus gnat population. They can be put horizontally along your plant pot and as the gnats are lured by the traps, they land on them and get trapped. One of the organic ways of effectively reducing adult fungus gnat population is by using an apple cider vinegar trap. You need to mix apple cider vinegar along with lemon scented dish soap in a bowl and cover it using paper or cloth. A few small holes on the paper or cloth will ensure the scent goes out and attract the gnats. Most often they try to go through the holes and fall into the solution and die. Most gnats including adult fungus gnats find diluted rubbing alcohol unbearable and poisonous. The idea is to use it on affected regions near the plant or in the garden using a spray bottle. Check the soil: It is important to ensure your soil is not too moist. 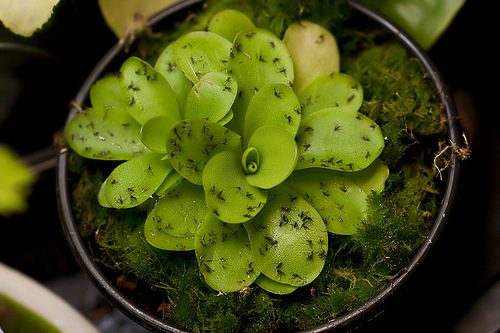 Moisture and usage of peat moss help fungus gnat to breed. This is the first step towards prevention of an infestation. Watering and drainage: If your plants need watering every day then you need to ensure potted plants have exceptional drainage. You need to also ensure that at least 3 inches of the top soil is dry. This will stop fungus gnats from laying any eggs. Adding horticultural sand: One of the natural prevention and maintenance remedies is to add horticultural sand right at the top of the pots. This is another method by which you can stop the fungus gnats from laying eggs. Apart from this, you can always use a mix of biological, chemical, and organic methods to ensure your plant is safe from possible infestation of fungus gnat in the near future! By Following the above said methods and tips you can be able to control the fungus gnats. If you are facing problems with the common gnats in house check it out the 54 ways to get rid of gnats in house, kitchen and outside.